Fantasy Matters: My Life as a Sith Lord: Light Side or Dark Side? My Life as a Sith Lord: Light Side or Dark Side? Like Adam, I, too, have been playing Star Wars: The Old Republic. 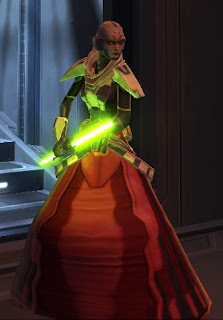 I played World of Warcraft for several years and really enjoyed it, but one of the things about SWTOR that really stands out to me is the way the game forces you to become immersed in the story of your character. And while I realize that my personal experience of the game does not equal a universal experience of the game (the plural of anecdote is not data), some of my experiences playing SWTOR reinforce an idea that I've had for a while--namely, that MMOs such as SWTOR can be a very valuable tool for thinking critically about questions of identity. But to back up a bit--in SWTOR, I play a Sith Assassin. As of right now, I'm level 43 (out of 50), and so I'm well on my way to earning the title "Darth" (as in Darth Vader, Darth Maul, etc.). I wield a double-bladed lightsaber and have an awesome scooter that helps me zip around from mission to mission. And already we see something simple, but quite interesting--I refer to my character (or avatar, if you'd rather) as "me." I don't say, "My character needs to do this mission," but rather, "I need to do this mission." The line between my character and my self is a blurry one, at best. Of course, game designers do everything they can to encourage this, since the more you feel like you're a part of the virtual world, the more you will play the game. SWTOR creates an immersive feeling very effectively by sending players on missions using interactive video, rather than text. Players see their character as part of a video clip, but then the video pauses and players are able to make choices about how their character responds. This enables players to be more invested in the missions, as they (seemingly) are able to influence what goes on in those missions. One of the most interesting ways this plays out is in terms of "Light Side" and "Dark Side" points. During some missions, players are able to choose between two outcomes--one that is usually more merciful, such as giving someone another chance, and one that is more ruthless, which usually involves killing. Mercy gets you Light Side points, ruthlessness gets you Dark Side points. You can get different gear for your character based on whether you are "Light" or "Dark." Now, I've decided that my character will be "Light," and that is in large part due to the strong association I feel between myself and my character. I'm not sure I would be 100% comfortable being ruthless and killing (sometimes) innocent people, even in a fictional setting. Perhaps most interesting to me, though, are the times when I have become so immersed in the storyline that I have gone against my decision to choose the "Light Side" options. One instance came when another Sith apprentice was incredibly rude, condescending, and ungrateful to me (I'd even just rescued him! ), and I couldn't take it--when given the choice between setting him free and killing him, I let him have it. And boy, did it feel good when I won. So, what does this say about me? Does it mean that I'm a cold-blooded killer? While that's obviously hyperbolic, I think this experience does suggest the usefulness of video games such as SWTOR to force players to think about the distinctions they make between themselves and the images they project to others--whether those are images in a video game or images projected to friends, co-workers, and neighbors in real life. Other games have done things like this as well--Bioshock is perhaps one of the most famous examples where players had to make a choice between moral action and earning more money. And, quite honestly, my actions--although in a completely virtual world--forced me to acknowledge the somewhat uncomfortable possibility that I wouldn't be the upstanding citizen that I am if I were given free rein to do whatever I like. While this is perhaps not a huge philosophical revelation, when experienced on a personal level, it can be rather eye-opening. It seems, then, that this is a huge area of potential for video games--to provide players the chance to experience and explore questions of identity that would otherwise just be abstract philosophical concepts, and therefore, to give these ideas the opportunity to have a more lasting impact.